NEWTON, IOWA (July 29, 2016) - NEWTON, IOWA - Todd Gilliland registered his fourth win of the season, leading 116-of-150 laps on his way to Victory Lane in Friday night's Casey's General Store 150 NASCAR K&N Pro Series combination race at Iowa Speedway. The 16-year-old NASCAR Next driver from Sherrill's Ford, North Carolina, took the green flag from the second starting position behind NASCAR Next alumnus Kyle Benjamin and swapped the lead with him twice before taking the point from Benjamin heading into the halfway break. Once the contest restarted, Benjamin grabbed the lead once again on Lap 81, but was quickly tracked down by Gilliland two go-arounds later. Gilliland sped away from Benjamin and the rest of the field, leading the final 68 laps of the race. Benjamin finished second, followed by Austin Theriault, Collin Cabre and Ryan Partridge. While Riley Herbst, Justin Haley, Hunter Baize, Gracin Raz and John Holleman IV rounded out the top 10. In addition to his four wins this season, Gilliland now boasts seven top fives in eight NASCAR K&N Pro Series West starts. His Bill McAnally Racing team has won the last three races at Iowa Speedway. The Casey's General Store 250 from Iowa Speedway will air on NBCSN Friday, Aug. 5 at 2 p.m. ET. The NASCAR K&N Pro Series East will be back in action at Watkins Glen International Friday, Aug. 5, while the NASCAR K&N Pro Series West takes the track next at Evergreen Speedway in Monroe, Washington, Saturday, Aug. 13. 1. (2) Todd Gilliland, Sherrills Ford, NC, Toyota, 150 laps, 98.294 mph. 2. (1) Kyle Benjamin, Easley, S.C., Chevrolet, 150. 3. (3) Austin Theriault, Fort Kent, ME, Toyota, 150. 4. (10) Collin Cabre, Tampa, FL, Toyota, 150. 5. (9) Ryan Partridge, Rancho Cucamonga, Calif., Ford, 150. 6. (5) Riley Herbst, Las Vegas, Nev., Toyota, 150. 7. (6) Justin Haley, Winamac, Ind., Chevrolet, 150. 8. (19) Hunter Baize, Bremen KY, Chevrolet, 150. 9. (17) Gracin Raz, Lake Oswego, OR, Ford, 150. 10. (7) John Holleman, IV, Winston-Salem, NC, Ford, 150. 11. (4) Jesse Little, Sherrills Ford NC, Toyota, 150. 12. (8) Cole Rouse, Fort Smith, Ark., Ford, 149. 13. (22) Noah Gragson, Las Vegas, NV, Ford, 149. 14. (12) Tyler Dippel, Wallkill, NY, Chevrolet, 149. 15. (20) Spencer Davis, Dawsonville, GA, Ford, 149. 16. (24) Blaine Perkins, Bakersfield, CA, Chevrolet, 149. 17. (29) Julia Landauer, New York, NY, Toyota, 149. 18. (11) Dominique Van Wieringen, Amherstburg, Ont., Ford, 148. 19. (23) Trey Hutchens, III, Lexington, NC, Chevrolet, 148. 20. (27) J.A. Junior Avila, Alhambra, CA, Toyota, 148. 21. (25) Christian Celaya, Caborca, Mexico, Ford, 147. 22. (26) Justin Fontaine, Fletcher, NC, Toyota, 147. 23. (30) Ron Norman, Tucson, AZ, Ford, 146. 24. (31) Will Rodgers, Murrieta, Calif., Chevrolet, 145. 25. (14) Chris Eggleston, Erie, CO, Toyota, 142. 26. (18) Harrison Burton, Huntersville, NC, Toyota, 142. 27. (32) Jesse Iwuji, Dallas, TX, Chevrolet, 140. 28. (33) Daniel Phillippi, Los Angeles, CA, Toyota, 139. 29. (15) Ali Kern, Fremont, CA, Toyota, 130. 30. (16) Chad Finchum, Knoxville, TN, Toyota, 123, suspension. 31. (28) Matt Levin, Tucson, AZ, Ford, 90, electrical. 32. (21) Grant Quinlan, Maidstone, Ontario, Ford, 56, electrical. 33. (13) Ruben Garcia, Jr, Mexico City, Mexico, Toyota, 40, engine. Caution Flags: 4 for 19 laps. Lead Changes: 5 among 2 drivers. K. Benjamin 81-83; T. Gilliland 84-150. IRWINDALE EVENTS CENTER, (IEC). 1/2 & 1/3 MILE. IRWINDALE, CA. www.irwindalespeedway.com SATURDAY, JULY 30TH. "After watching a whole team of first responders successfully fight a ferocious fire on some of the hottest days of recent record, we decided to invite all of them out to the Speedway for a "cool" night of fun ... watching some exciting NASCAR racing at Irwindale Speedway." That's how Irwindale Event Center President/CEO, Jim Cohan announced a special night at the Speedway to honor the many people who worked the recent San Gabriel Complex Fire. "Irwindale Speedway wants to invite all regional Fire Fighters, California Highway Patrol Officers, Los Angeles County Sheriff Deputies, US Forest Service, Cal Fire personnel and all partnering state and local agencies who were involved with the Complex Fire, to join us as our honored guests on Saturday night, July 30th 2016. We were eye-witnesses to how seamlessly all of the agencies worked together to fight the massive San Gabriel complex fire. "We appreciate the service and are sincerely grateful to all first responders," Cohan went on. "Whether they were answering phones, directing traffic, coordinating air drops and ground units, protecting people's property or right there on the fire lines ... these people are all heroes in our book. Our parent company is named 'Team 211' and we want to celebrate this great team of heroes." Here's how the night will work: Anyone who worked the fire for any of the above agencies will be welcomed as a guest on Saturday night, July 30. All they'll need to do is show ID to be admitted free of charge. Each first responder will be able to purchase guest tickets at a special $5.00 at the box office window. All of the invited first responders are asked to come early so that they can be honored right on the front straight of the race track during the singing of the 'Star Spangled Banner' at 6:45PM before racing begins. A "group portrait" of the all the first responders will be taken from the starter's tower and will run on the front page of the Speedway's website. There's going to be plenty of on track action to support this special IEC evening. Racing under the title of Hot Summer Nights, The Pick Your Part Late Models will highlight Saturday night's program by running twin main events. Also on the racing agenda will be the Seidner's Collision Centers Race Trucks, the INEX Legends and the Seidner's Collision Centers Skid Plate Racing Series. The spectator gates will open at 4pm followed by the on track autograph session at 545pm and racing at 7pm. Adult admission is $10 if the tickets are purchased in advance between now and Friday. Reserved adults tickets can be purchased via the speedway's website or by visiting the office located at 500 Speedway Drive in Irwindale. On Saturday race day adult tickets, purchased at the front gate, will be $15. Child admission is $5. There's also a $5 parking fee. KERN COUNTY RACEWAY PARK. 1/2, 1/4 & 1/8 MILE. BAKERSFIELD, CA. www.kernraceway.com. SATURDAY, JULY 30TH. Kern County RWP will be presenting their NASCAR Whelen All American Series program this Saturday night featuring on track action from the NASCAR Spec Mods, NASCAR Mini Stocks, the 911 Series, driven by area law enforcement officers, and, for you motorcycle racing fans, the Golden Empire Super Moto Series. The special guest division will be the Race Car Factory Spec Late Models who will be making the first of three scheduled appearances.Saturday night. The series operates under a stringent rule book that calls for identical car fabrication, power plants and set ups. That means the difference maker in the series is largely based on driver talent which, in turn creates, some very exciting racing. On Saturday race night the spectator gates will open at 5pm with the racing receiving the green flag at 7pm. General admission tickets for adults are $10. Reserved grandstand tickets, featuring a non smoking area, are $15. Tickets for youth, age 6 to 15, seniors, age 65 plus, and military personnel are value priced at $7. LOAN MART MADERA SPEEDWAY. 1/3 MILE. MADERA, CA. www.racemadera.com SATURDAY, JULY 30TH. If you had to describe the racing programs at Madera in two simple words "fully loaded" would be a good choice. Loan Mart Madera will be presenting another one of their fully loaded shows this Saturday night highlighted by the MAV TV televised Loan Mart Open Late Models and the 51 FIFTY Junior Late Models. Also fully loaded and ready to race will be the Super Hobby Stocks, Legends of the Pacific, Mini Cups, the MST Series and the Toyota Sedans. Saturday race day begins with a 2pm practice session followed by qualifying at 4pm, heat races at 6pm with opening ceremonies and main events set for 630pm. Adult general admission tickets are $15 with tickets for seniors priced at $13. Youth tickets, age 6 to 12, are $7 with kids age 5 and under admitted free. ORANGE SHOW SPEEDWAY. 1/4 MILE. SAN BERNARDINO, CA. www.the orangeshowspeedway.com SATURDAY, JULY 30TH. The OSS returns to action this Saturday night with a full, and diversified, racing line up led by the Open Late Models, running a 50 lap main event and the 1 800 Loan Mart Street Stocks. Also on the race agenda is on track action from the Mini Stocks, the Orange Show Speedway Modifieds, Extreme Exhibit Outlaw Figure 8's, Bandoleros, and the always fun Barber Pole race. A special practice session, open to all divisions, will be held Saturday morning beginning at 830am. Entry fees are $50 per car. Later in the day, at 1pm, the standard pre race practice will be held followed by qualifying at 315pm, heat races at 6pm, trophy dashes at 7pm and main events at approximately 725pm. General admission tickets are $10 and $8 for seniors and kids. Active duty military personnel, with valid ID, and kids age 6 and under will be admitted free. UKIAH SPEEDWAY. 1/4 MILE. UKIAH, CA. www.lakeportspeedway.com SATURDAY, JULY 30TH. The Lakeport - Ukiah Speedway Challenge Series, presented by Furia Motorsports, returns to Ukiah this Saturday night featuring their old school, but very fun, racing divisions. Providing the on track action will be the Bomber, Jammer, Jalopy and Modified divisions. The spectator gates will open at 330pm. Qualifying will start at 5pm with racing to follow. General admission tickets are $12. Tickets for seniors, age 60 plus, and students with valid ID cards are $9. Kids tickets, age 5 to 11, and first responders with valid ID are $6. Toddlers and infants will be admitted free. The speedway also offers a budget friendly family package, priced at $30, which admits two adults and three kids. 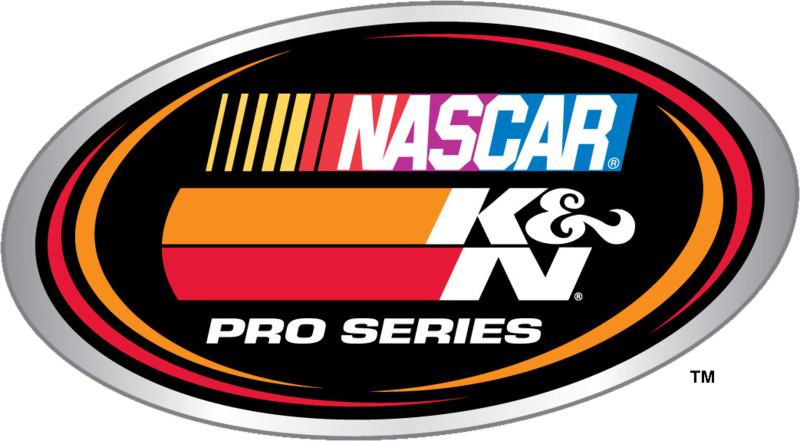 DAYTONA BEACH, Fla.(July 27, 2016) — The NASCAR K&N Pro Series East and the NASCAR K&N Pro Series West both head to Iowa Speedway in Newton, Iowa, for their annual combination race in the Casey’s General Store 150 presented by Vatterott College on Friday night. Below is a look at the race itself and some of the selected participants. • This marks the only Iowa Speedway visit of 2016 for either the K&N Pro Series East or the K&N Pro Series West. • The race is a combination event for the two divisions and a companion to the NASCAR Xfinity Series race at the track. • Justin Haley, who has two wins this season, holds a 40-point lead atop the series standings over Kyle Benjamin in the East. • Ryan Partridge sits three points ahead of three-time race winner Todd Gilliland in the West. • The first NASCAR-sanctioned race at Iowa was in May 2007, as a NASCAR K&N Pro Series East-West combination event was won by a 17-year-old Joey Logano. • The 13 East-West combination events at Iowa have produced 12 different overall race winners and 12 different overall pole winners. Brandon McReynolds, who swept the two K&N Pro Series races at the track last season, is the only repeat overall winner at Iowa. • Kyle Busch, Cole Custer and Brandon McReynolds are the only three drivers to win the East-West combination race at Iowa from the pole. Chase Elliot started the furthest back and won, coming from 15th on the grid in May 2012. • The average starting position for the winner is fifth while the pole sitter has an average finish of 8.25. • Chevrolet has gone to Victory Lane in seven East-West events at Iowa, while Toyota has five wins and Ford has one. • Heads into the weekend ranked second in the East standings with five top fives and six top 10s in nine races. • Has made three career starts at Iowa with a best finish of sixth in 2015 and two top-three starting positions. • Has one career win in the series, at Bristol last season. • Is a NASCAR Next alumnus. • Is ranked seventh in the East standings with one win, one top five and four top 10s through nine races. • Won at Mobile in only his second career series start. • 2015 K&N Pro Series West champion is third in the current standings with two wins, six top fives and six top 10s in seven races this season. • Has finished fifth in each of his first three career starts at Iowa. • Making the third start of the season and the 15th start of his career spread out over five seasons. • Won at Bristol Motor Speedway in April. • Heads into the weekend ranked third in the East standings with three top fives and five top 10s in nine races and fourth in the West standings with four top fives and seven top 10s in seven races. • Won his first career K&N Pro Series East race at Stafford Motor Speedway in June. • The Las Vegas native finished second in the NASCAR K&N Pro Series West standings in 2015 with two wins and 7 top fives in 13 races. • Currently sits second in the NASCAR K&N Pro Series West standings with three wins through seven races. • Won three consecutive West races beginning with the season finale at Phoenix in 2015 and ending with the first two races of 2016, at California’s Irwindale and Kern County. • Has made five K&N Pro Series East starts this season, including a win in the season opener at New Smyrna Speedway in February. • Is making his first career start at Iowa. • Has two wins this season and leads the East series standings with eight top fives and nine top 10s in nine races. • Only East driver to finish in the top 10 in all nine races thus far this season. • Has made three career Iowa starts, finishing fourth in both races in 2015. • Has two career East wins, including being credited with the division win at Iowa in 2015. • Finished second last year to Brandon McReynolds in this race, who was racing for West points. • Has three top fives and four top 10s in seven career starts at Iowa. • Also won at New Hampshire in 2014. • Leads the West series standings with one win, five top fives and seven top 10s through seven races and is one of only two West drivers to finish in the top 10 in every race this season. • Has two career Iowa starts with a best finish of sixth. • Sits fifth in the West with four top fives and seven top 10s this season. • Finished in the top 10 in both Iowa races last season. • Picked up his first career West win last season at All American Speedway. • Is fifth in the standings with five top fives and six top 10s through nine races. • Finished a career best second at Columbus Motor Speedway on July 2. Bakersfield, CA – With over $156,000 paid out in 2016, the Winter Showdown has reached the distinction of “America’s Richest Short Track Race”. The 2017 edition of the Winter Showdown held at the state-of-the-art, Kern County Raceway in Bakersfield, California has moved its race weekend up two weeks to February 9th, 10th, and 11th in 2017. The Winter Showdown will be in its third year in 2017, and has hosted the nation’s top Super Late Model drivers. Senoia, Georgia’s Bubba Pollard is the only driver to take home the distinctive Winter Showdown trophy. Pollard collected a record $40,000 for his win in 2016, which was his second consecutive Winter Showdown victory. The 3rd annual “Winter Showdown” is set for February 9, 10, and 11, 2017, at Bakersfield, California’s Kern County Raceway. For rules and additional information go to www.srlsouthwesttour.com, contact the SRL office at 661-679-4681, or email lcollins@mesamarin.com. MADERA, CALIFORNIA (July 26, 2016) – After a five week break, the MAVTV-televised LoanMart Open Late Models and 51FIFTY Junior Late Models continue their 2016 seasons with race number five Saturday at Kenny Shepherd's LoanMart Madera Speedway. In addition to the 150 laps of Late Model action, the one-third mile oval will also host Super Hobby Stock, Legends of the Pacific, Mini Cups, MSTs, and Toyota Sedans. La Grange's Matt Erickson enjoys a substantial points lead in the Open Late Models, buoyed by three wins to open the year followed by a runner-up finish in the last event on June 18th. The margin is now 67 points over Southern California truck champion Joey Licata with Altamont champion Ryan Philpott of Tracy another seven points back. Both drivers finished outside the top-ten on the last event. Bryan Herzog finally got his new car dialed in and has strung together a pair of top-twos, finishing second on Memorial Day Weekend and winning on June 18th over Erickson. The races were nearly identical in their makeup but with swapped finishing orders. The hottest driver in the series is Napa's 15 year-old Logan Zampa. Zampa podiumed on May 28th before missing the June 18th race. On July 16th, he raced in the Madera local Late Model competition and won over a 16 car field for his first career victory. Taking the win in front of the SRL Southwest Tour teams was an added bonus for the driver with his eyes on moving up the ladder. 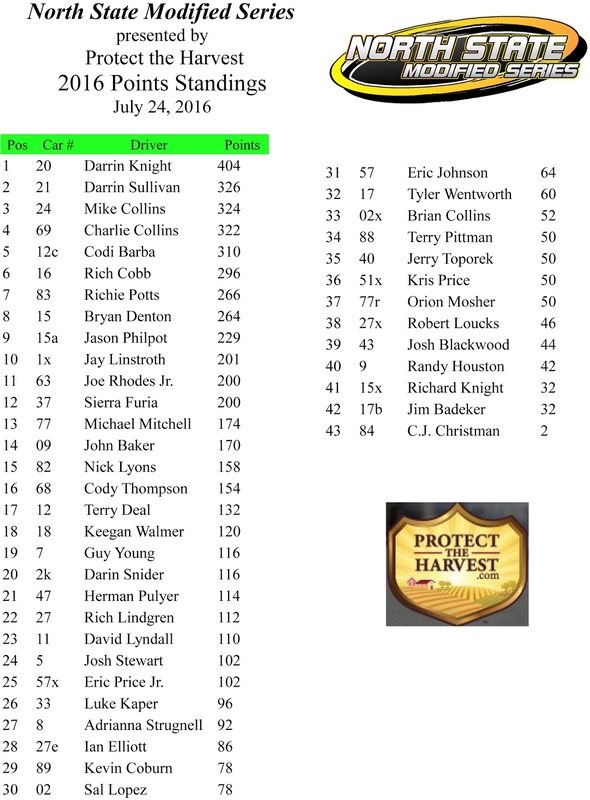 Dos Palos' Ryan Hart rounds out the top-five in the points ahead of Garland Tyler, Glenn Cook, Ronnie Roberts, Shelden Cooper, and Justin Philpott. 21 drivers have run at least three of the first four races. A much closer championship battle is unfolding in the 51FIFTY Junior Late Models with a tie at the top. Austin Herzog, 13 of Clovis, has won three of the first four races in this first of its kind series for ages 10-16. Herzog's win on June 18th was perhaps his most spectacular, using an outside move on Southern Californian Ryan Vargas, 15, as the field came to the white flag for the win. Vargas bounced off the wall with a flat tire and finished 11th to fall to fourth in the points. He recently competed in the Late Models at Kern County Raceway Park, leading laps in his debut at the half-mile. Las Vegas' Dezel West, 12, has two fast-times, a second, a fourth, and two sixth place runs on his resume to rank in a dead heat with Herzog. 11 year-old Canadian Ben Silliker is third, just 21 points behind. Vargas is fourth followed by Micro Sprint racer Jarrett Gilmer. May 28th winner Austin Edwards occupies position six. Legends of the Pacific touring series makes its fifth appearance of the year at Madera and routinely draws from Northern California and Southern California for its Madera races. Rocklin's Robby Czub and Tracy's Jeremy Wood have held a firm grasp on the series with Wood getting the most recent win on July 16th. In the Super Hobby Stocks, Joseph Reichmuth has a win and two second place finishes for a seven point cushion over June 18th winner Chuck Dozhier. Thomas Suarez, Eloy Bazan, and Ivan Scorsur round out the top-five. Mini Cup rookie Jackson Dukes has been an instant success visiting victory lane in race two and leading the points over second year driver Adam The Bullet Lemke from Hollister who won round one. Lemke also has won the traveling Mini Cup races in Stockton as well and competes in the USAC HPD Midgets at Madera on occasion. Kevin Thompson's five main event victories has him leading Bert Stephens by 42 markers in Modified Super Toyota (or MST), with the balance of the top-five for the dimunitive Modifieds including Dave Lander, Zachary Cook, and Rian Bowman. Their full fendered counterparts in the Toyota Sedans have the females of Jillaun Holden and Lucy Carmona at the top of the standings. Thomas Magray, Mike Marley, and two-time winner Jason Lawton round out the top-five. Tim Curtis has also picked up a pair of victories this season. Race fans can catch up on LoanMart Madera Speedway racing with another original episode of "Madera Racing" The coverage will include both the June 18th round of Jr. Late Models and the June 11th race for the Madera Winged Super Sprints! "Madera Racing" airs Thursdays on MAVTV at 8 p.m. Eastern / 5 p.m. Pacific. An open practice kicks off the weekend on Friday before another full day of action on Saturday. Pit gates open at 11 a.m. with practice from noon to 3:00 p.m. Qualifying fires off at 3 p.m. with the grandstands open and ticket windows opening after qualifying. Heat races fire off at 5:15 p.m. with opening ceremonies and the first features set for 6 p.m. Modified Series race at Redwood Acres Raceway in Eureka Saturday night. July 23, 2016. ….Eureka, CA..... The North State Modified Series, presented by Protect the Harvest, returned to Redwood Acres Raceway in Eureka Saturday night as a part of the Lithia Chrysler Jeep Dodge Ram night at the races. Seventeen modifieds took part in the action with NSMS points leader Darrin Knight of Kelseyville the man of the hour, first setting fast time of 16.192 seconds and then passing Darin Snider (Kelseyville) on lap 35 to collect $1000 for his win in the Swartz Diesel Super 60 feature. Mike Collins (Lakeport) lead the field to the start but when the cars entered into the first corner it was Snider who blasted into the early lead. All cars finished lap one, but on the second circuit Rick Andersen (North Highlands) slapped the wall on the backstretch, and when he tried to recover he clipped Eric Johnson's car. The impact sent Andersen into a 360 spin, and although all cars continued, the incident created a blinding dust barrier bringing out the yellow flag. Snider chose to restart in the outside lane and once again took control of the race with Mike Collins second, Knight third, Charlie Collins fourth and Darrin Sullivan fifth. Richie Potts swapped places with Sullivan to join the top five. Knight was on a mission and dove under Mike Collins for second on lap four. Charlie Collins followed his line, also moving under Mike Collins for third. Meanwhile Snider was putting a healthy distance between him and the rest of the pack. Knight slowly lessened the gap and was tight on Snider's bumper by lap 18. Knight looked high and low, waiting for Snider to make a mistake. 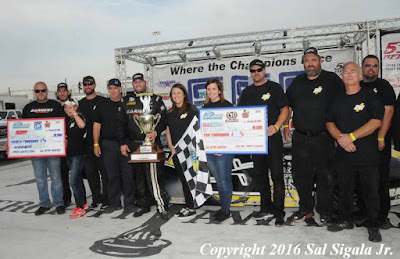 Snider continued to lead, and at the Wrap Star Pro half-way marker it was Snider, Knight, Charlie Collins, Mike Collins, Potts, Sullivan, Johnson,, Rich Cobb, Sierra Furia, Andersen, Herman Pulyer, Codi Barba, Ian Elliott, Adrianna Strugnell, Orion Mosher and Randy Houston. Five rounds later Snider's car pushed slightly and it was all Knight needed to fill the space and take over the lead for good. Once again Charlie Collins capitalized on the move, followed Knight, and stole the runner-up slot from Snider. As the top four pulled away it was a good battle at mid-pack with Sullivan taking position away from Potts, and Andersen batting with Sierra Furia. The last half of the race saw the leaders flawlessly move through lapped traffic. Snider's car lost its power steering ending his run on lap 42. Barba lost a rear end and drove to the pits on 51. Knight lead the pack to the checkered flag followed by Charlie Collins, Mike Collins, Darrin Sullivan and Eric Johnson. Rounding out the top 10 were Potts, Andersen, Cobb, Pulyer and Furia. In the Lucas Oil Dash for Cash Potts collected $100 for the win, with Johnson getting $50 for second. Charlie Collins earned the Wenteq Hard Charger Award. Cobb took home the Naake Suspension award, and the DJ Safety Certificate went to Sullivan. The Scribner Plastics went to Furia and Snider. Knight earned the Penney Racing Supply/Sunoco Fast Time Award. 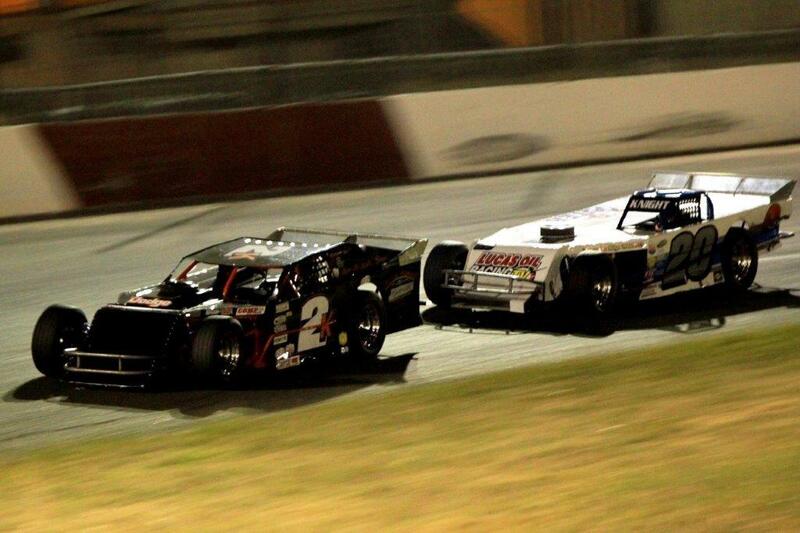 Race #7 of North State Modified Series will be at Madera Speedway on August 13. The modifieds will run on the same card with the Pacific Challenge Series Late Models. The North State Modified Series is presented by: Protect the Harvest, Swartz Diesel, Lucas Oil, Sinister Diesel, Penney Racing Supply, American Racer Tires, Naake Suspension, Sunoco Fuels, Five Star Bodies, Wrap Star Pro, Wenteq, Scribner Plastics, DJ Safety, Renner Petroleum and the Buckhorn Bar & Grill. Both sides of Redwood Acres Raceway were filled this past Saturday for Lithia Dodge Chrysler Jeep Dodge Ram of Eureka Night at the Races. In addition to the six local divisions of cars, the North State Modified Series returned to RAR for the second and final time in 2016. Bethany Rapp was quick time in the California State & Federal Employee Credit Union roadrunner division with a 20.813. James Nickles won the four-lap trophy dash which saw an incident between Rapp and Jennifer Murrell that effectively ended Rapp’s night. Heat race on was taken by Bob Ratzloff while Dylan Ford won heat two. Ratzloff led the opening four of the scheduled 25 lap feature until Ford took the lead away. On lap six, Nickles’ engine let go down the back stretch into turn three. Behind him, several drivers hit the oil and wrecked. Involved were Steve Paiment, Tyler Peach and Brandon Katri who were all knocked out of the event. The race was cut to 12 laps due to the lengthy cleanup. Ford led after the restart and was able to hold off Murrell to take the win. Dominic Vogelsang, Jake Keeling and Patrick Sproul rounded out the top five. The Fortuna Wheel and Brake bomber class had an excellent turnout of 14 cars thanks to Lally Motorsports and Four Star Realty upping the purse for the evening. Erick Ray set fast time with a 18.166 and was the winner of the trophy dash. Ryan Ahrens was the winner of heat one while Brian King won heat race two. The 25-lap main featured a spectacular duel for the lead between King and Ray. King was able to take the lead away from Lally on lap eight and did all he could to fend off Ray for the lead. After a neck and neck duel for the lead, Ray was able to finally secure the lead on lap 16. Ray led the rest of the way to take the main event win, the first at RAR for the Sacramento driver. King placed second followed by Matt Manlos, James Moore and Ahrens. 14 cars took time in qualifying in the Humboldt Hydroponics mini stock division but unfortunately Todd Simpson and Shawn Molloy both had issues which prevented them from racing. Dylan Hagmann was the fastest qualifier with a 18.910 time. Gary Klinetobe won the trophy dash while heat race winners were Cole Peterson and Hagmann. Troy Lee led the opening lap of the 25-lap feature before giving way to Peterson. Gary Klinetobe took over on lap five and looked to be the guy to beat. However, as the race progressed, it was Rick Estes who had the strongest car and on lap 19 he wrestled the lead away from Klinetobe. Estes was able pull away and take the victory over Klinetobe. Daniel Buell placed third followed by Brett Murrell and Eugene Palmer. Fast time for the Thunder Roadster division was Tommy Payne with a 17.214. Aaron Byers was the trophy dash victor while Donnie Brown claimed the heat race win. The focus of the 30-lap feature was on Payne and Ronnie O’Neil who seemed to have equal cars. O’Neil tried everything he could to find enough momentum to challenge Payne for the lead but never could. At the finish it was Payne winning followed by O’Neil, Byers, LeRoy Marsh, Jr. and Brown. Qualifying for the Legends cars was paced by Brad Curtice’s 18.243. Denny Hadler, Jr. was the trophy dash winner while the heat race winner was Brian Kamisky. The 25-lap feature was dominated by Kamisky who was never seriously challenged for the lead. One incident slowed the race, a turn four accident involving Hadler, Jr. and Robert Miller. At the finish it was Brian Kamisky winning handily over Miller, Brad Curtice, Troy Kamisky and Anissa Curtice. 14 Mid City Motor World late models qualified for the night with Oregon veteran, Mike Sackett setting fast time 15.919. Sadly for Sackett, he suffered problems which prevented him from participating further on the night. Tim Crenshaw was the winner of the trophy dash. Due to the tight schedule for the night, heat races were abandoned. Al Acune led the opening seven laps of the 50-lap main but contact between he and Ryun Leazer sent both drivers to the rear of the field. Eddie Klien was moved to the lead and had the best race of his rookie season as he led over half the race. A late race restart proved to be Klein’s downfall as Marty Walsh was able to get the jump and take over the lead. Klien’s good run went bad when he and Kenny Demello made contact on the front stretch sending both cars spinning. 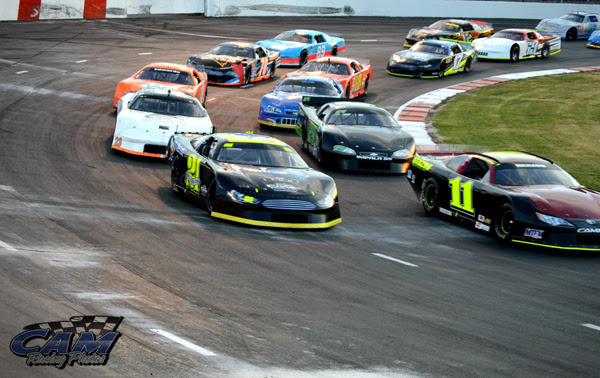 The final handful of laps featured a duel for the lead between Walsh and Moulton. Walsh prevailed to take the win followed by Moulton. Dustin Walters had his best run of the year in third followed by Jedd Ambrosini and Richard Knight. 17 North State Modifieds showed up for the Swartz Diesel Super 60 event for the evening. Unfortunately, one of the top contenders, Bryan Denton suffered issues before qualifying which forced him out of action for the night. Series point leader, Darrin Knight was quick time with a 16.192. Richie Potts was the winner of the Lucas Oil Dash for Cash earning $100 for his efforts. The Swartz Diesel Super 60 was slowed only once due to a spin by Rick Anderson on lap one. Darin Snider led from the drop of the green but it wasn’t long before Knight moved to second and set his sights on the leader. It was the Darin and Darrin show as fans were thrilled by the fantastic nip and tuck duel for the lead between the two drivers. Knight was finally able to get under Snider on lap 33 to take the race lead. Snider pulled his car into the pits after his strong run on lap 42. At the front it was Knight taking the win, sweeping both NSCS races at the Acres in 2016. Charlie Collins had a strong run in second over Mikey Collins. Darrin Sullivan was fourth, the final car on the lead lap while Eric Johnson placed fifth. One of the most anticipated events of the year follows on August 6th when the Spears SRL Southwest Tour Series returns to the 3/8-mile paved oval for the third time. The Bear River Casino & Hotel and Renner Petroleum 125 promises to be intense and action-packed with the top super late model racers on the west coast taking to the Acres pavement. Grandstands open at 5:00 PM while racing begins at 6:00 PM.